Almost like being there? 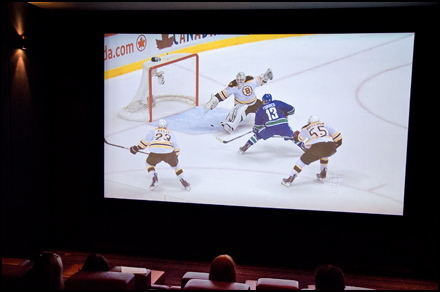 The Hazelton Hotel's Silver Screening Room was a terrific spot to see the goal on Wednesday. George Cavey should’ve been there when Raffi Torres scored the goal. The Canucks’ fan had tickets to Game 1 of the 2011 Stanley Cup Finals but had to give them up when a last-minute business trip jettisoned him to Toronto on Wednesday. Luckily for Cavey, the Hazelton Hotel helped to ease the sting of not being there. Cavey was high-fiving with the others in the room — all cheering for the Canucks — when Torres lit the lamp at Rogers Place on a terrific feed from Jannik Hansen with 19 seconds left in the third period. The 1-0 win over the Bruins moves Vancouver a step closer to bringing the Cup back to Canada for the first time since 1993. “This is a big event. It’s a big deal to have a Canadian team in the finals. We wanted to do something special and open up this space for people to enjoy it,” said the Hazelton’s general manager, David Mounteer. The hotel threw in some complimentary beer, soft drinks and popcorn for guests, who could also order food and drinks from ONE, Mark McEwan’s on-site restaurant. Dan Winer wasn’t a guest at the hotel but he’s held a few events in the Screening Room and got the invite to attend from the Hazelton. He brought along a few friends who responded to his posting on Facebook that encouraged them to come. 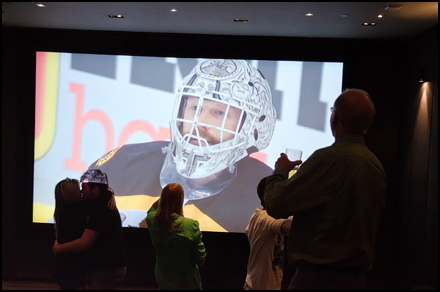 Fans cheer at the screening room after the Canucks finally beat Tim Thomas. “The Hazelton kills it for doing something like this,” Winer said enthusiastically. I agree – it was pretty cool to experience the game in the screening room. Kudos to the Hazelton for hooking into the passion we’ve got for the game and for turning over its gem of a theatre to our national pastime. Game 2 is Saturday at 8 p.m. With a little luck and the right pull on the right strings I’ll be tweeting away at Rogers Place in Vancouver.